If you are considering installation of vinyl siding, New Jersey weather will make a big difference in the timing and type of siding you choose. The best times of year for your siding installation project will be in Spring or Summer (March through September), but New Jersey is known for Summer showers so be flexible and make sure your contractor has tarps available. Given the wide swings in temperature from the Jersey Shore to inland and from June to December, you will need a heavier gauge siding that will resist cracking and warping. Premium vinyl siding grades run between .46-.55 inches thick and is recommended in areas with variable climates and high winds. Have all of the necessary building permits in hand before you begin your project. Familiarize yourself with any state and local codes or neighborhood covenants that might apply to the installation of exterior siding on your home. Vinyl siding may be common in Jersey City's row houses, but not allowed in Princeton's Queen Annes. To avoid stopping work during the project, make sure that all necessary materials are on site before you begin installing the siding. 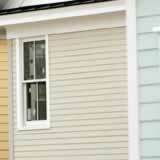 Double check your siding order to make sure you have the correct amount of panels, trim pieces and other accessories. If you need to remove your home's old siding before you install new vinyl siding, then complete the work during good weather, and arrange to have a dumpster on hand for the old siding and other discarded materials. Keep in mind that you may need several days to remove your home's old siding, as well as to make any needed repairs to the underlying sheathing and house wrap. If you have hired someone to help you install your new siding, make sure they can commit to be present until the project's completion. Prices may vary. New Jersey and the Eastern Seaboard tend to be more expensive areas of the US in which to hire contractors. Based on a recent survey of vinyl siding prices conducted by VinylSidingZone, East Coast contractors labor costs were 40%+ of the total bid. Since labor costs vary widely based upon demand, your total vinyl siding estimate could vary widely from what your neighbor paid last year. Planning ahead for your siding project can help ensure that you avoid delays caused by missing materials, poor weather and workers gone AWOL. Like other home improvement projects, installing new vinyl siding can be quicker, and less expensive, when you plan ahead.